Ethiopian Prime Minister Abiy Ahmed has created a new office to oversee and implement an agreement with former rebel groups, local media reported on Tuesday. Earlier this month, the Horn of Africa nation has signed an agreement to end hostilities with the Oromo Liberation Front (OLF), which it had previously declared a terrorist movement. The deal was reached between President of the Oromo Region, Lemma Mergesa and OLF Chairman, Dawd Ibsa. The agreement covers disarmament, demobilization and reintegration of former fighters, according to Abiy’s chief of staff. “The Premier has appointed Tesfaye Yegezu to lead the Project Office tasked to coordinate this effort,” a tweet from the chief of staff read. Since the 1970s, the rebels have fought a low-level insurgency for self-determination for the Oromo region. The Oromo region has a handful of historical demands that have been amplified since the protests broke out three years ago. This month deal is part of PM Aby’s reforms to improve security in the East African nation and upgrade its diplomatic relations. Since he took office in April, his reforms have included extending an olive branch to dissidents overseas. 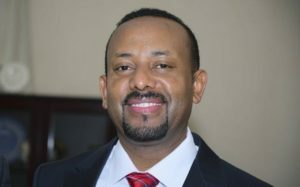 He has also acknowledged abuses by security services and ended a military stalemate with Eritrea. Posted by Khalid Al Mouahidi on August 29, 2018. Filed under News. You can follow any responses to this entry through the RSS 2.0. Both comments and pings are currently closed.